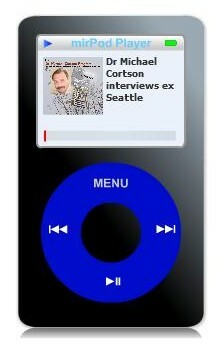 You want to podcast on your website, so you need a podcast player. Here a free player for you. You have a web site, a blog, and you want a free player, a radio Blog, that can play your podcasts or mp3 files or XSPF playlist. 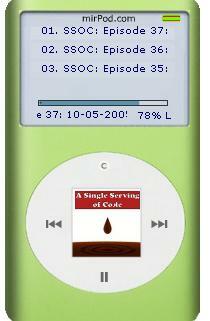 Now you can get mirPod Player, a podcast player in Flash technology. 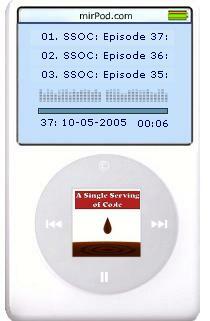 mirPod player can play podcast RSS feeds and XSPF files. If you have mp3 playlist and if you don’t know how to make a podcast feed please read this article : How to make podcast feed Doing podcasting you can propose your shows to many site and be read by a lot of players. 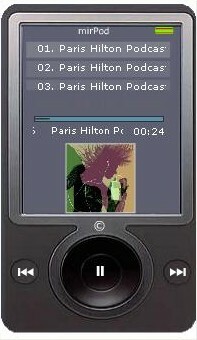 MirPod player is a podcast flash player, it only accepts mp3 files for audio (no files OGG, WMV, M3U). Flash doesn’t support vbr (variable bit rate) mp3 files. if you play vbr mp3 files, the playback will sound like a chipmunks version of your songs. The best way to encode mp3 files is to use a fixed bitrate of 64/96/128 kbps with a sample frequency of 22.05kHz and joint stereo. You can use mirPod Player as a Web Service. No need to download software. You only have to write on your website few lines of HTML code to have access to the player. If you plan to use Mirpod Player for commercial purposes, please contact me so we can work out a suitable arrangement. I ask you to add your podcast to Mirpod Directory before using Mirpod Player. You have to put a link to www.mirpod.com on your website. If you don’t follow these instructions I should be very sorry to stop this web service. These players can play video files or audio files even if they can’t be handled by Flash opening a new popup.